Okay guys I've finally cracked the waffle magic, after numerous attempts and adjustments here we are just in time for Christmas. The gingerbread really comes through in these and I'm excited to try them out as plain waffles as well. They also happen to be gluten-free as well as vegan. This may be the last recipe of 2017 and i just wanted to write a little note of reflection for this year has been fantastic to say the least, my instagram page following has doubled this year and i get to interact with so many more of you! which i love by the way its the best part! 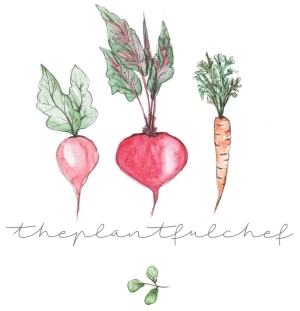 I used to run a blog called beautyandthebakes which i know many of you must be from, relaunching as theplantifulchef has been the best decision and getting to have more say so over the design of my blog was the best way to go. Right I've waffled enough now... get it waffled... ahhh 2018 you hold so many more corny jokes. Let get into the recipe folks, its why we are all here. Place all vinegar in with the milk and set to the side. Mix up all of your dry ingredients well. Whip up your aquafaba into stiff peaks and set aside. Now the milk should have curdled a little, add in your vanilla, agave and molasses. Now its time to mix everything together, first place your wet ingredients into your dry and mix well. Then fold in your whipped up chickpea water. Now preheat your waffle maker and follow the manufacturers instructions. This made around 8 individual mini waffles for me. 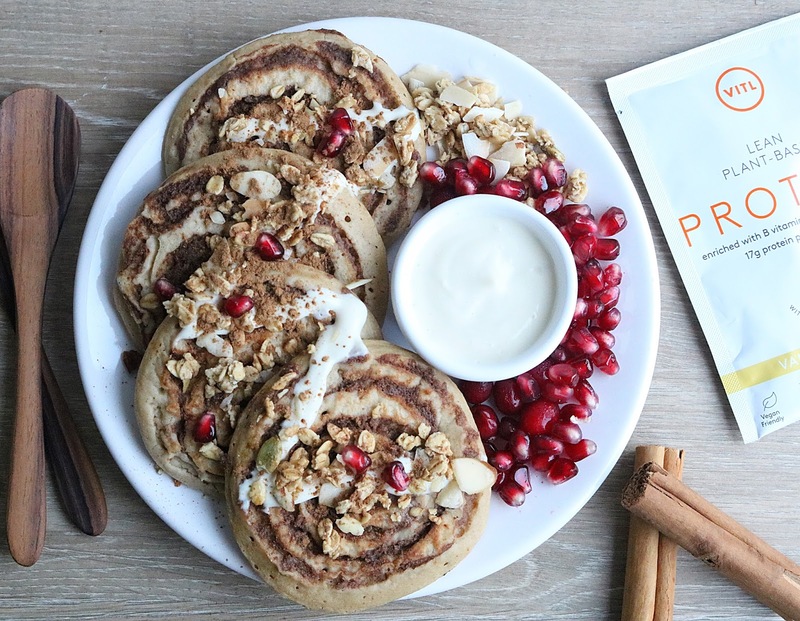 Afternoon, just thought i would drop by with these cinnamon swirl pancakes. Finally the recipe is now live, hurray! Lets get into what your going to need. These pancakes are gluten free and are only sweetened with a few dates, so a breakfast acceptable treat. Combine wet and dry ingredients for the pancakes and set aside to thicken up for around 10 minutes. While its thickening up blend dates with water until a smooth batter appears, you may need to add more water depending on the strength of your blender. Add in the cinnamon and a pinch of salt and transfer it to a pipping bag. Mix up the frosting and place back in the fridge ready for serving. Now your batter is ready for the pancakes. Make sure to heat your pan over low/medium heat with a little coconut oil. Drop batter into pan and before the top starts to set swirl in your date mixture try and put it actually into the batter rather than just on top as it may come away when you flip your pancakes. Once the pancakes are showing several bubbles, flip them over for a minute to cook the swirl side. Remove from the pan (there may be some date paste on the pan just scrape it off onto the pancakes it tastes like toffee) Serve with frosting and a little seasonal fruit, i also smashed up some granola pieces and sprinkled them on top just for that added crunch. Hope you enjoyed this recipe, they keep wonderfully well over night in the fridge covered up. just simply place in the microwave on the morning for 30 seconds to make them warm again. These would make the perfect christmas morning pancakes. Who doesn't want to be eating cinnamon bun anything christmas morning right? Don't forget to tag me if you decide to make these, i love seeing your recreations! Okay so I've been playing around with a muffin recipe for a while now to get just the right texture. Those of you who do gluten free baking know how complex that can be. But i know I've finally cracked it with these muffins, perfect breakfast muffins as they don't contain much added sweetener either. Preheat oven to 170 fan oven. Mash the banana and add in the yogurt, maple syrup, vanilla, almond butter and flax egg. Add in all your flours, baking powder and soda. 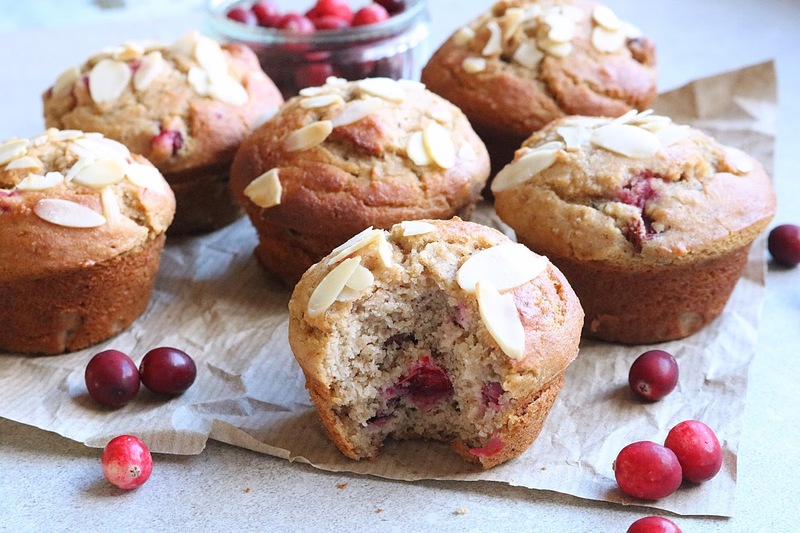 Fold in your cranberries and bake for 20-22 minutes. 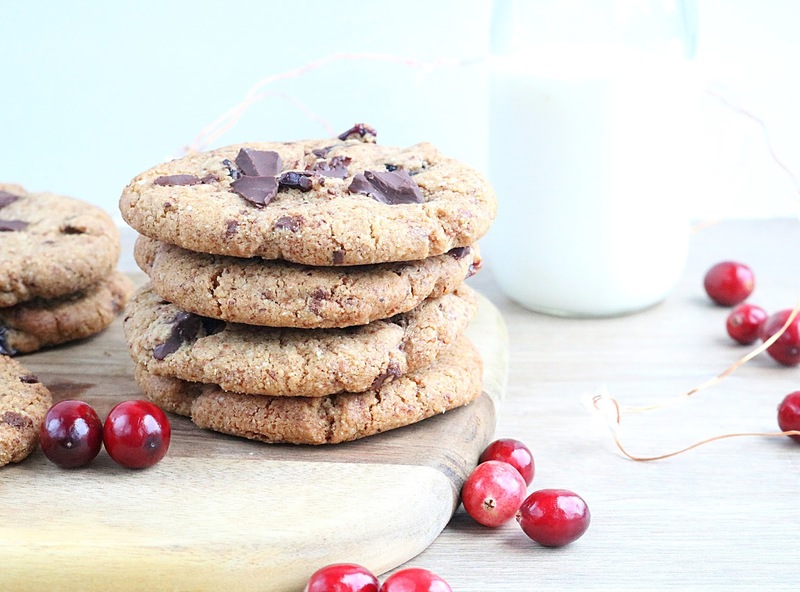 Oh my these cookies are such a festive treat, loaded with juicy dried cranberries and chunks of chocolate all coated in a chewy almond cookie. Really enjoyed coming up with this recipe, i based it off a classic chocolate chunk cookie I've been working on for some time now which I'm trying to get the right balance of almond flour in to make sure thats not all you can taste. Lets dive in to what your going to need for these cookies just 10 simple ingredients 1 mixing bowl and we can be diving into these cookies within 30 minutes. 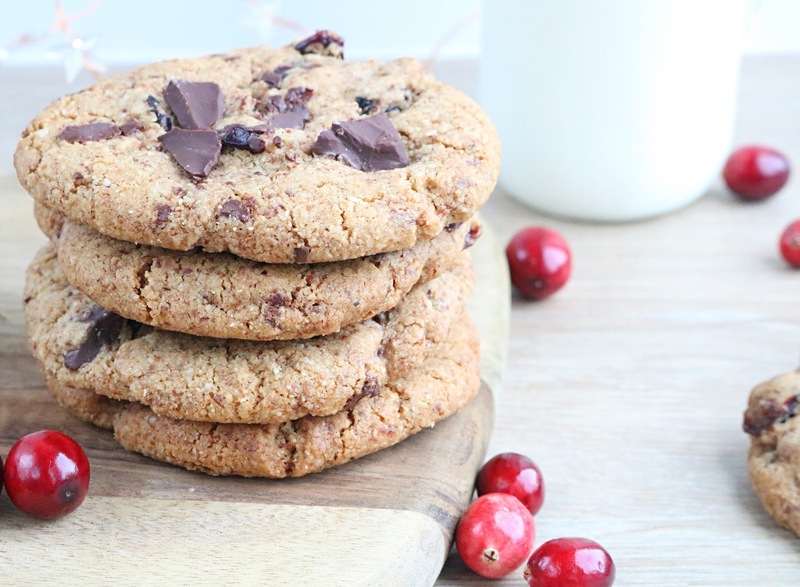 Prefect for a spot of weekend baking, makes around 8 cookies that are quite large. Preheat the oven to 160 fan oven. Mix the coconut sugar and coconut oil together, add in the almond butter and vanilla. Next add in the flour both almond and buckwheat make sure to add in the baking soda. Then add in the maple syrup it will now come together with your hands. Then squeeze into the mixture the chocolate and cranberries reserving some for the top of the cookies to press in before they go in the oven. Separate into 8 equal balls and gently press down so they are really small thick flattened balls as they will spread a little in the oven. Place in oven for 10-13 minutes until lightly golden. Remove and leave to cool on the tray as they will not be holding any shape to move them. 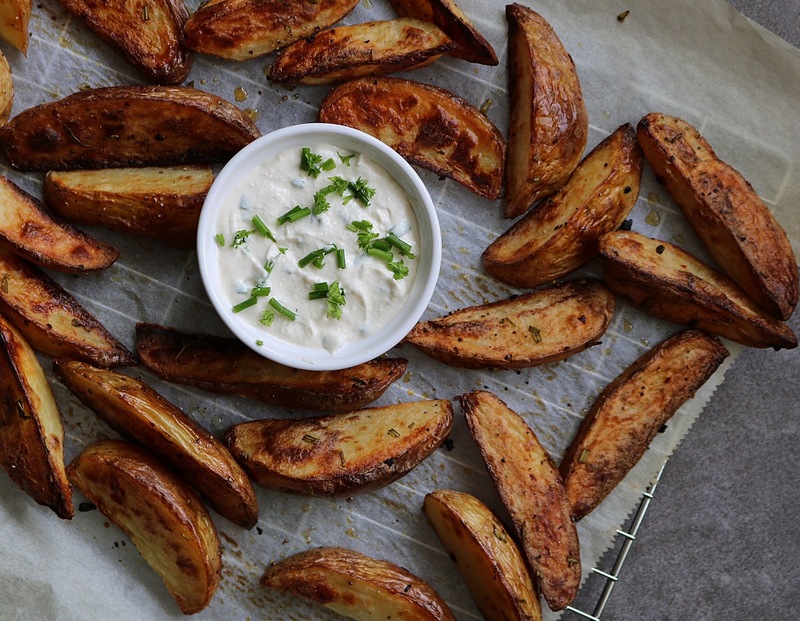 Once cool enough not to burn your mouth, serve with cashew milk and enjoy dunking. So this is my twist on the classic dessert. 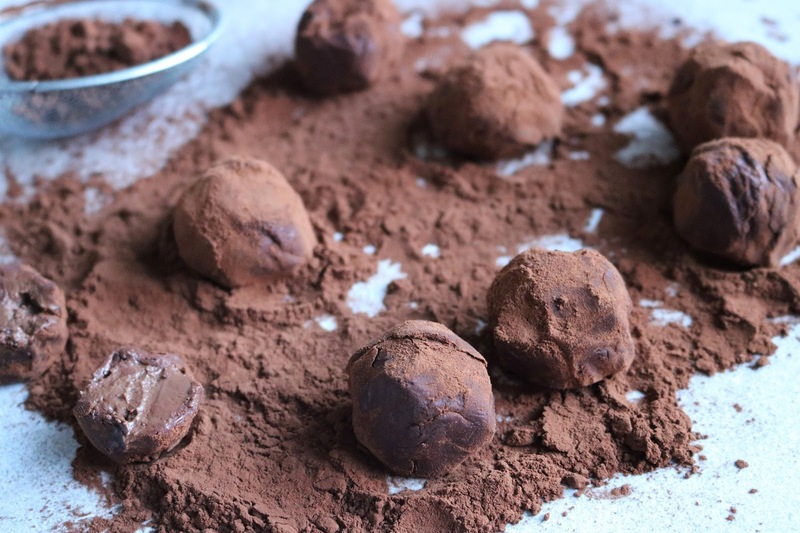 Ive used some trek toffee protein bites for this but i do have a toffee bliss ball recipe in the works as well if you can't get your hands on them. Quite enjoyed this twist on the classic desserts. Who knows this may well become a mini series on here. Lets dive straight into the recipe, those who have followed me for a while know I'm not one for chit chat at the start of a recipe. All i want to say is this is really easy and makes a great snack or a little indulgence for breakfast on the go. Soak your chia seeds in the milk for a few hours until a thick mixture forms. Then add in the yogurt and vanilla return to the fridge. To make the caramel add ingredients to blender and add a little water if you need it to get going. Roll bites into balls. Now lets assemble, layer up with some banana in the bottom and side of the glass. 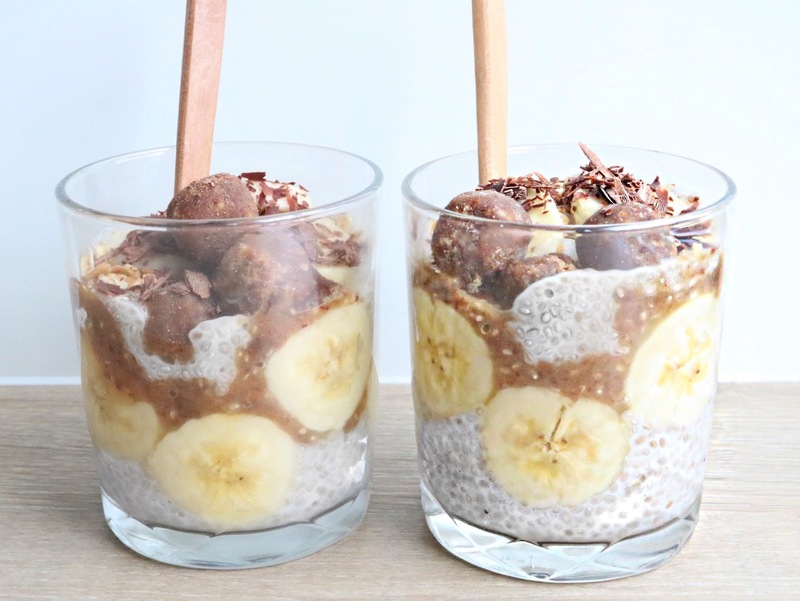 Then some chia pudding, next up some of the caramel, add in the bliss balls and top with a little flaked chocolate. Serve and enjoy. 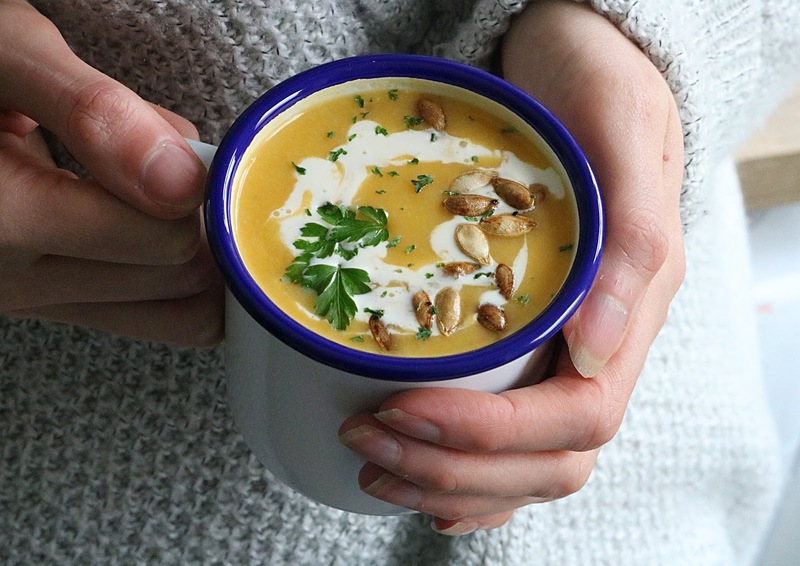 Squash is officially in season and while its a nightmare to get open and the skin off this soup is very much worth it, even those pesky seeds don't go to waste. Ive added a little curry powder and turmeric to this soup but its fine without it. Just taste it first to see what you think. First off wash and dry the seeds from the squash place on greaseproof paper with a drizzle of oil for around 20 minutes at 180fan until crunchy keep checking them. Next get your pan over medium heat and add in the onion, celery and garlic let them fry for a few minutes then add in the squash. Let this brown off in the pan this adds lots of flavour to the soup. Then go in with the cauliflower and stock and coconut milk you want to hopefully cover all the vegetables with this. Bring to the boil then leave to simmer for 20 minutes until everything is cooked through till its soft. Blend until smooth add salt and pepper to taste. If you want to add the curry and turmeric now is the time to do so, stir into the soup while its still on the heat. 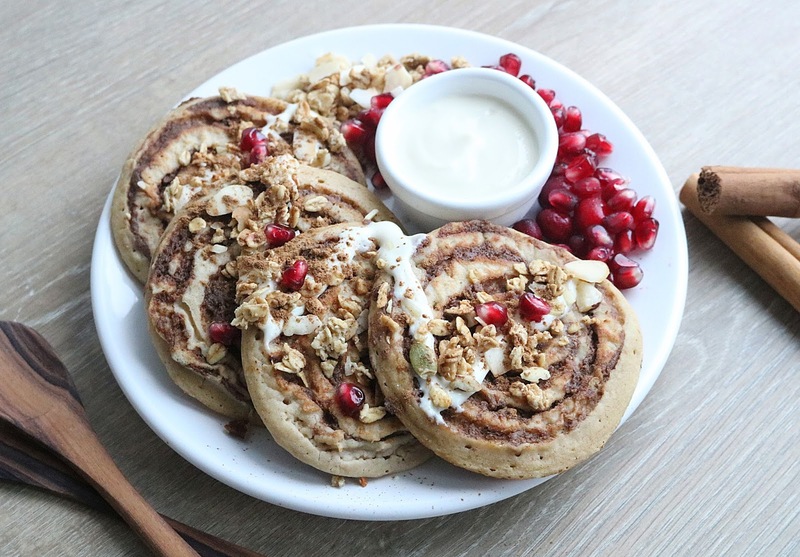 Serve with swirls of soy cream and sprinkles of crunchy seeds. 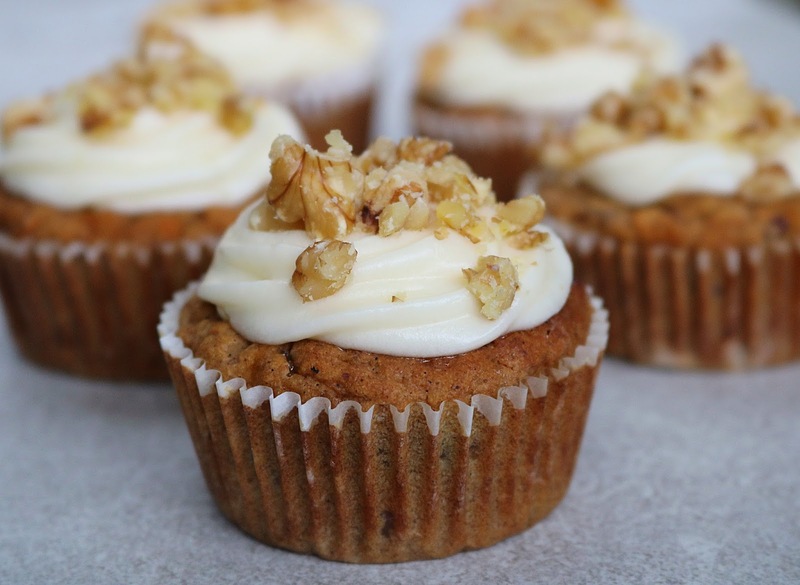 So I've posted these over on my page a few times now and keep getting asked for the recipe. Thought i would pop them over on the blog for everyone and who knows, maybes you have just stumbled upon these by accident! what a happy accident that will now become. 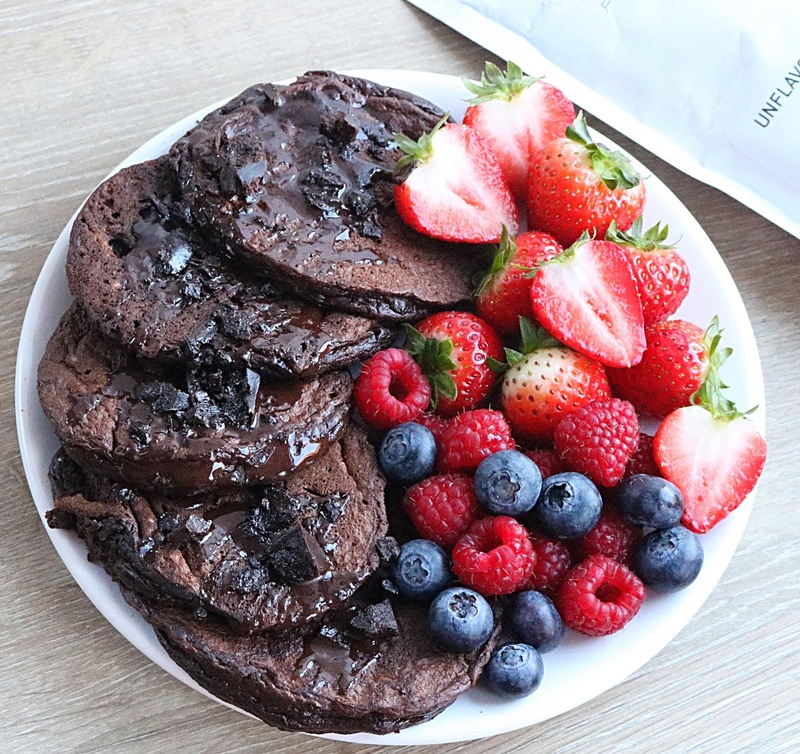 These pancakes are so rich and almost gooey inside, paired with some fresh fruit they really are a big breakfast treat. Lets get onto what your going to need. Mix everything together in a large bowl i usually add the milk at the end. Place mixture into pipping bag, this is the secret to getting round pancakes. Pipe into a pan over medium heat with some coconut oil in and leave for a good few minutes before attempting to flip over, i found these took slightly longer than regular pancakes to cook. Makes around 8 pancakes. 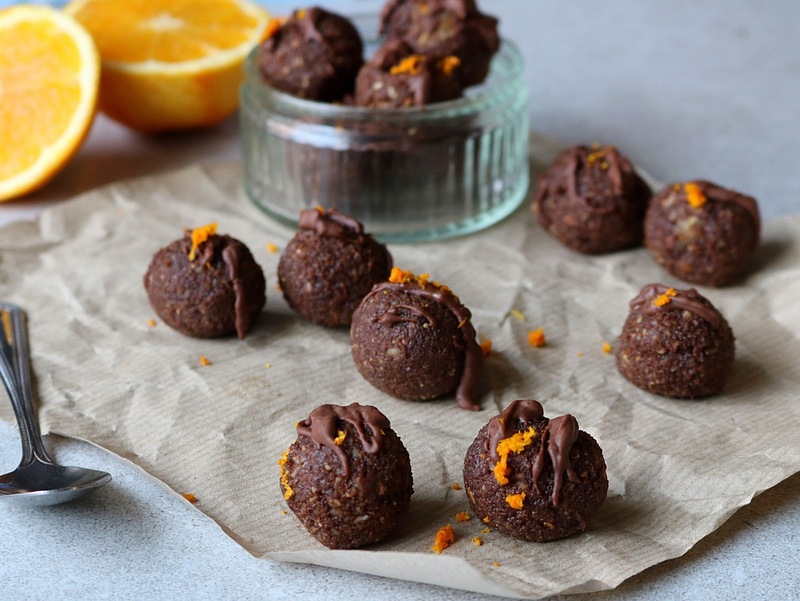 Chocolate orange balls that remind me of christmas day and terrys chocolate orange getting passed around in the afternoon. Really simple to make if you have some oranges laying around, which i always seem to at this time of year. Think i might make some of these this christmas to see what everyone thinks. They can be drizzled with dark chocolate and orange zest for that extra kick at the end. Place everything in food processor and mix until a sticky dough forms roll into balls and drizzle with dark chcocolate and more orange zest. I hope you enjoyed this recipe if you do decide to make this make sure to tag me over on Instagram i love seeing your recreations! Ok so one of my followers asked if i would tell them recipe for my quick chia jam i usually put on toast etc. I thought its pretty simple i shall pop it on my website so everyone can see it if they wish. Place ingredients, berries, vanilla and maple in a microwave save mug and microwave for 30 seconds at a time for 2 minutes, give it a stir every now and again and mash a few berries if you wish. When it comes out stir in the chia seeds leave to cool down and set up for 15 minutes for till its thick enough and cool enough to eat. Spread on your favourite toast, or my favourite on top of peanut butter. If you do decide to make this recipe be sure to take a snap of it and upload it to Instagram tag me in the picture i love seeing your recreations and sharing them with my followers. 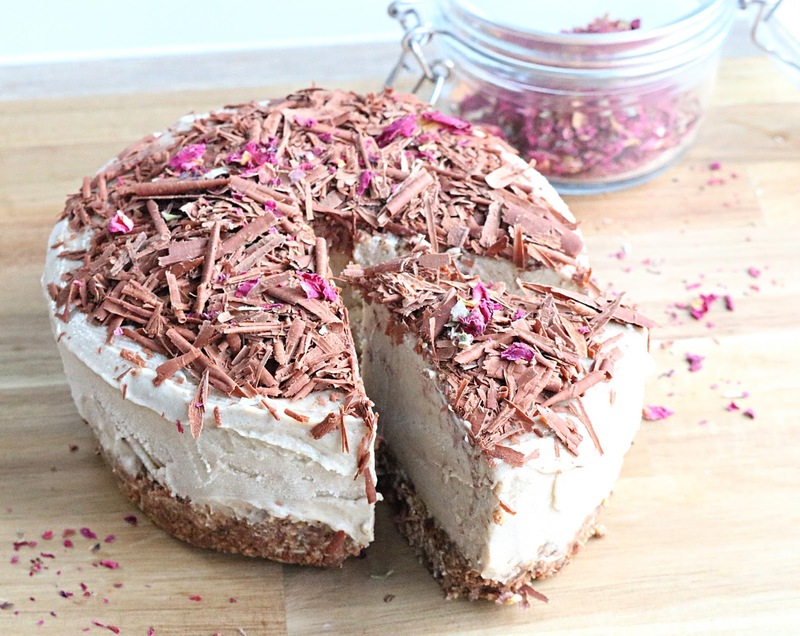 Okay so this idea came about when flicking through Jamie Olivers new simple ingredients cookbook and came across a semi frozen cheesecake using 5 simple ingredients. Excited to try it i thought why not do it with a twist and make it vegan, gluten free and free from refined sugar. I had so many messages last night asking for the recipe for this, my inbox was literally going crazy! So i decided to write it up on here for easy reference for everyone. I should really do this for quite a few recipes i have posted on my page. Absolutely love sharing pictures and creating recipes for you guys, just sometimes have no idea what to write on a blog post. So onto what your going to need for this. Just to letting you guys know jambs recipe was twice this size so if you want to make it bigger (serving 10) just double the recipe here and use a 20cm tin. Thats literally all you need to make this cake, how amazing is that? ok so I'm going to split this up into 2 sections first the base heres what your going to need. Pulse ingredients in a food processor until a semi sticky dough forms, press in it into a lined spring tin (around 12cm) put to one side. Place everything back into the same processor and blend until smooth, place on top of the base and place it in the freezer to freeze over night. when your ready to eat it take it out the freezer and leave to thaw out (i left mine out for 1 hour in the fridge) Top with chocolate shavings and in my case rose petals completely optional. Serve and enjoy! Ok so i have spoken a few times about these amazing buttermilk pancakes that i have posted on my Instagram from my old website. I had seen some buttermilk pancakes on Pinterest that contain eggs and thought I'd start experimenting with some Aquafaba instead to see how they turned out. These pancakes are oil free and don't stick to the pan. 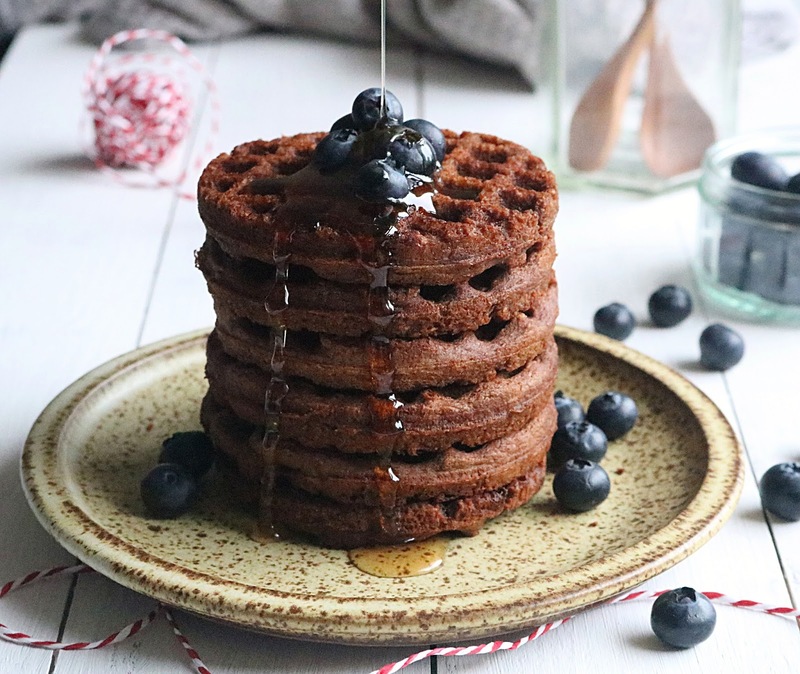 Right onto these amazing pancakes, they are fluffy light and so tasty! First off add the lemon juice to the milk and give it a good stir and set to the side. Next off you want to whisk up your aquafaba with your creme of tartar this may take a good 5 minutes set to the side. Now we are going to add everything together, the milk should have curdled and thickened a bit by this point. Put your milk and flour and other dry ingredients into the bowl and gently mix, also add in your sweetener. When everything is mixed together smooth fold in your aquafaba mix. Heat your pan to low/medium heat and use the 1/4 cup measuring cup to place your batter in the pan. You should see bubbles on the top before you flip over the pancakes. Top with warmed blueberries and coconut yogurt and enjoy! If you do decide to make these come over to social media and show me, i love seeing your recreations and posting them on my page. It's been a while, but I could resist sharing this recipe with you guys. It makes such a delicious sandwich filler, even tried it ontop of a baked sweet potato and it was amazing. 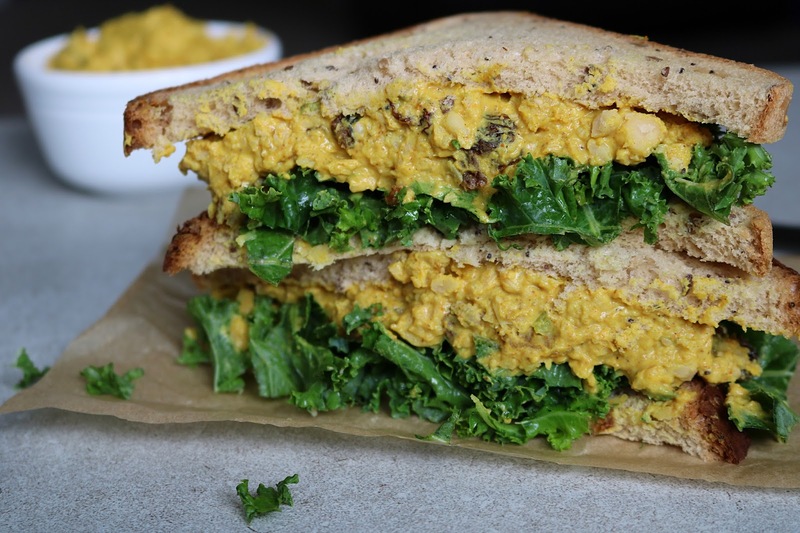 I was never a big fan of the coronation chicken in my meat eating days, this I could have every week! My friends have even tried it out and said they did not miss the meat. Right lets get on to what I used for this delicious filler. Firstly drain and wash the chickpeas throughly, place into a bowl and mash the chickpeas with a fork but not too much you want some of them semi mashed. Place the yogurt and mayo in the bowl and mix together, add in the spices and mix again. Lastly fold in the sultanas, apricots and celery. Mix well to combine then spread on your favourite bread and enjoy. Good evening everyone, thought i would share with you all this wonderful dip that I've been making recently. Before i went plant based i used to really enjoy some sour cream and chive dip from the supermarket with veggies. I thought it can not be that hard to make so i had a go. The first attempt did not go so well but i took it off to a BBQ that night, a lot of it didn't get eaten and i was a little disappointed by my efforts. When i got home that night it went in the fridge and i went to bed. The next morning i thought "oh i better throw that dip away so i can wash the box out but i will just try it first"... and guys it was amazing the flavours had come alive and it tasted just like the ones you buy in the supermarket deli section. So yes i would say for best results leave in the fridge overnight and enjoy the next day, even the texture changes to this thick amazing creamy deliciousness. Right lets dive into what i used i will give alternatives where i can for things you might not have in your country. Place all ingredients in a food processor aside from the chives and spring onions which you need to dice into small pieces. Blend the mixture until smooth then fold in the spring onion and chives. Leave in the fridge overnight to thicken and the flavours to come out. 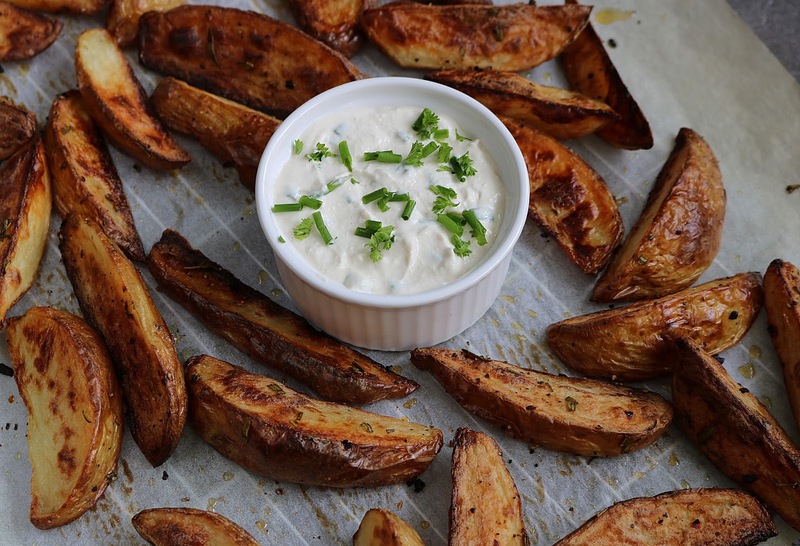 Serve with wedges or your favourite veggies. 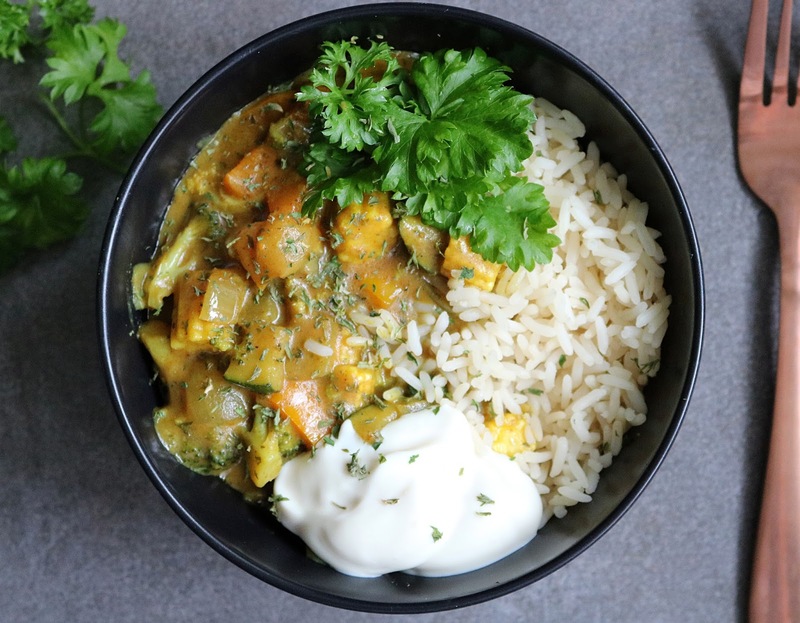 This has to be my favourite weekday curry of all time its so easy and quick and simple. Great if you have some leftover veggies from the night before to add in as well. Its creamy and mild with a little kick at the end, its pretty crowd pleasing. In my house i actually get requested to make this once a week so i knew i had to share the recipe. I always like to get my prep done first when I'm cooking that way the cooking has all my attention. Right lets dive into what your going to need. Take a frying pan over medium heat. Brown off garlic onion and ginger in a pan with a tiny amount of water add in the oil then all the spices and cook for a few minutes. Add in the courgette, broccoli and pepper and fry for a few more minutes. When it's browned a little add in the coconut milk, crumble in the vegetable stock cube and add the bay leaf. Sprinkle in the parsley and turn the heat to low/medium heat and cook for around 15minutes until the veggies are tender if it's gone a little thick add some plant milk, season add in more curry if needed for your taste and stir in your leftover veggies. Leave on the heat for a few minutes to warm them through. Serve with rice and a scoop of plant yogurt. 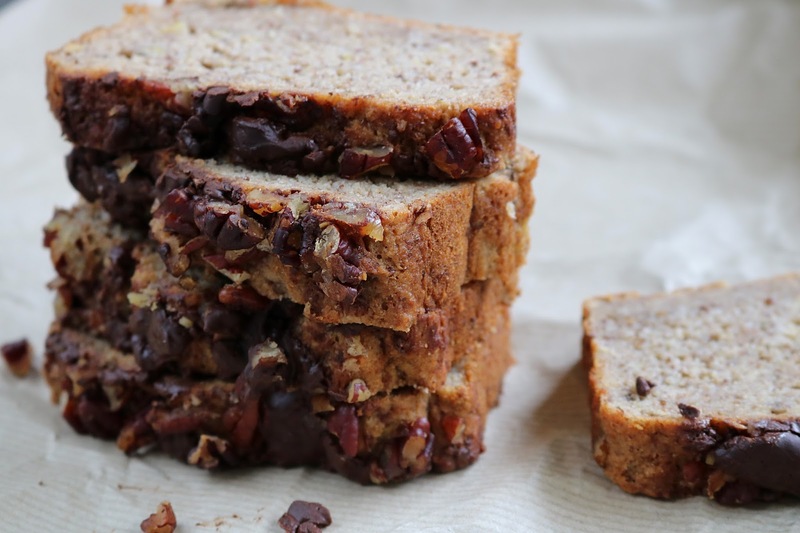 Everyone needs a banana recipe to make use of all those extra ripe bananas in the house right? I have such an awful habit lately of buying big bunches of yellow sticker (reduced) bananas in the supermarket because I think sometimes I can't resist a bargain! And who doesn't like things like banana bread and nice cream? both are diet essentials in my eyes. Line your loaf tin and pre heat your oven to around 160fan. 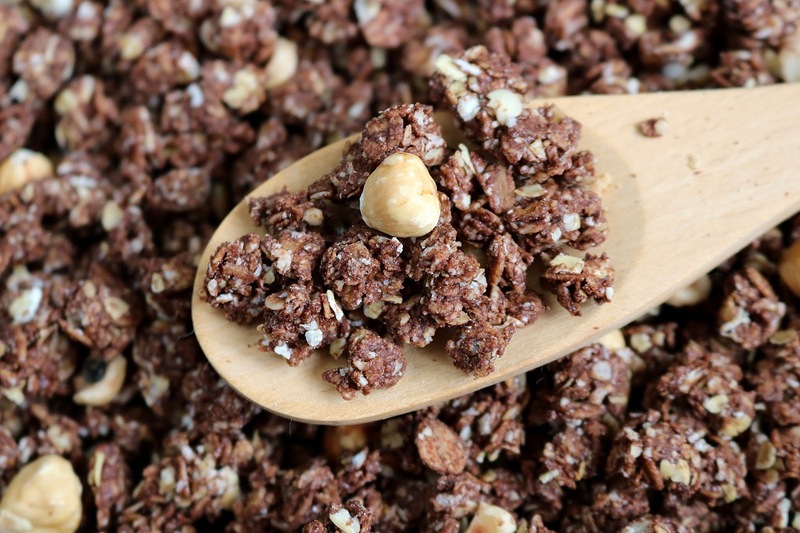 Place dry ingredients thats listed at the top into a bowl and make sure its distributed evenly. Add your wet ingredients listed below into a second bowl and give them a stir to make sure they are mixed together well. Simply add the wet to the dry mixture and fold together trying to make sure you do not over mix the bread. 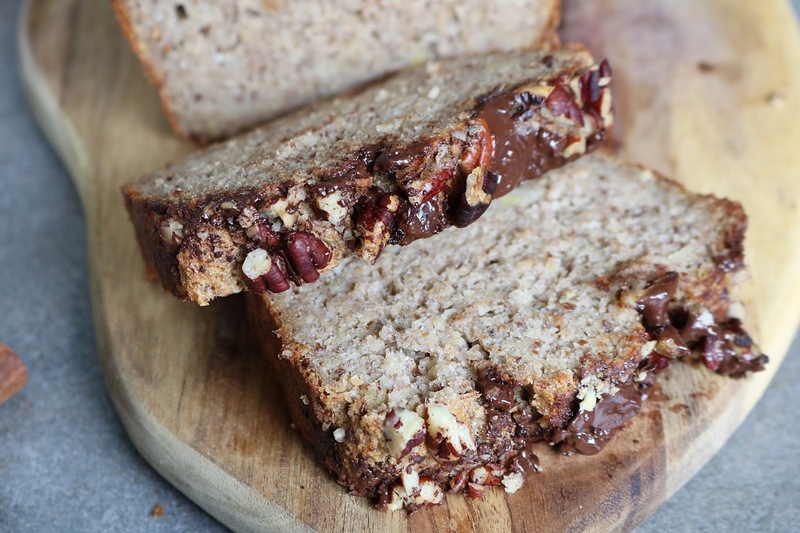 Place in the lined loaf tin sprinkle with pecans and chocolate. Bake for around a hour until a knife interred all the way to the bottom comes out completely clean (remember ovens do vary so keep an eye on it) Leave in the tin to cool and slice up to enjoy. 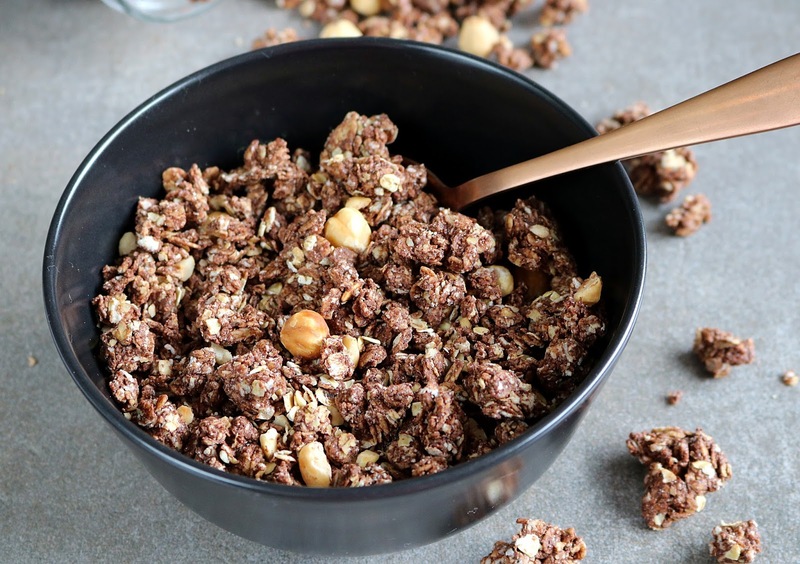 Chocolate and hazelnut granola, thats free from refined sugar and vegan. Really easy to make and means you can be eating it well within the hour. 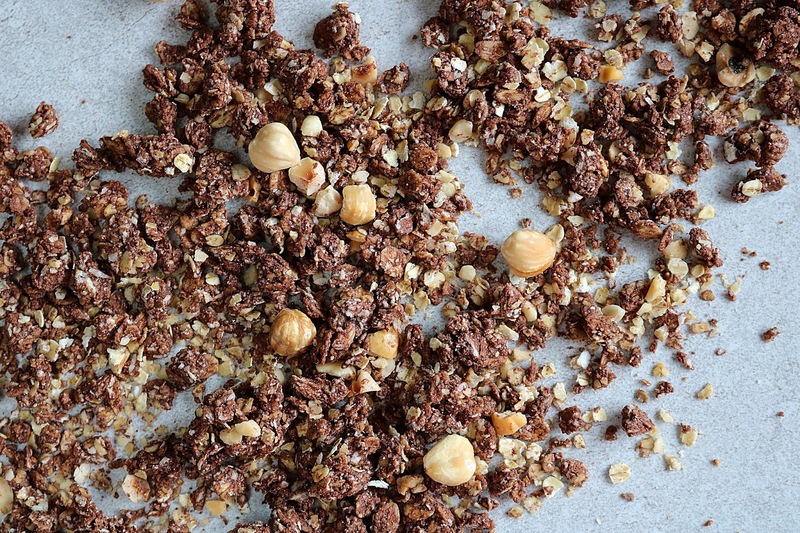 What you will need for this chocolate hazelnut crunchy goodness. First off preheat your oven to 150c fan and pop the 1/4 of hazelnuts in just for 5 minutes. Next up get your coconut and maple syrup melting on the lowest heat. When both are ready transfer hazelnuts into a food processor and blend for around 5 minutes scrapping the sides down now and again. Now add in your cooled maple syrup and coconut oil mixture blend again make sure its all combined. Now add in your carob powder vanilla and a pinch of salt. Mix well then add this to you oats and chopped hazelnuts. Spread mixture onto a baking sheet and bake for around 25-30 minutes checking and giving it a stir every 10minutes. Store in a air tight container. 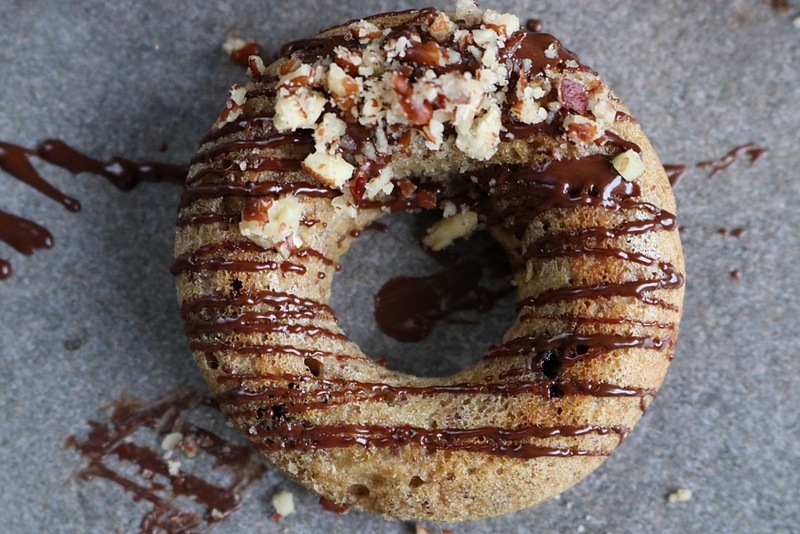 Banana bread in a mini doughnut form, bursting with little chocolate chips, drizzled with a little chocolate and sprinkled with pecan nuts. 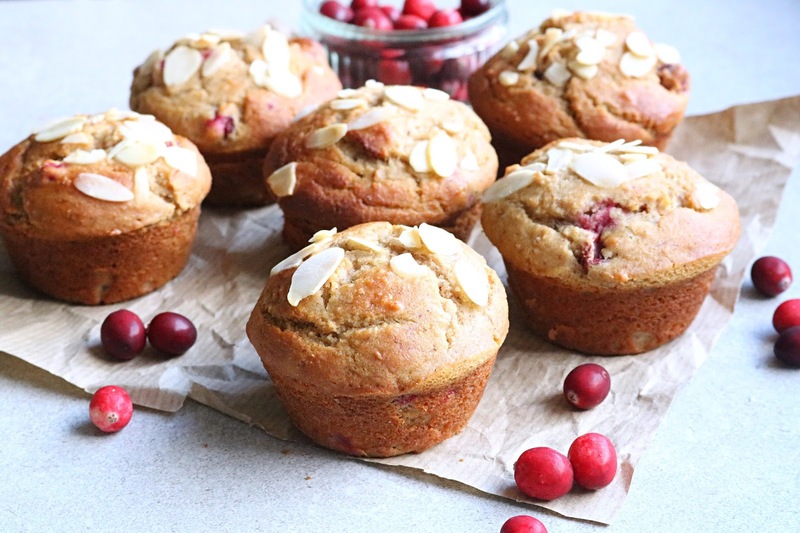 So delicious and fluffy, so hard to just have one... these make such a nice little change to banana bread muffins or traditional doughnuts that are packed with refined sugar. 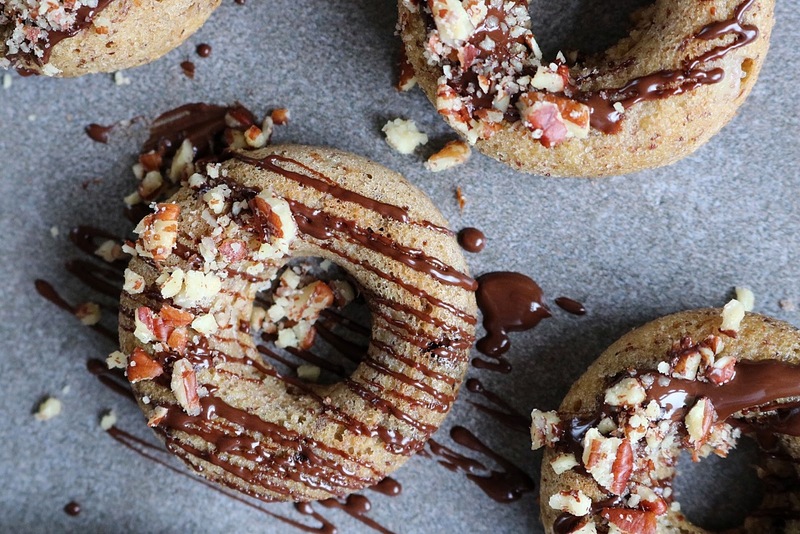 I originally thought of making these as a breakfast doughnut, then the chocolate chips got added in and that kind of went out the window.. ooopps! You could totally leave them out of course and fold in some nuts and/or cacao nibs? Or you could go all out and have the dark chocolate goodness, i made these with a mini doughnut tin so two or three of these is completely acceptable. 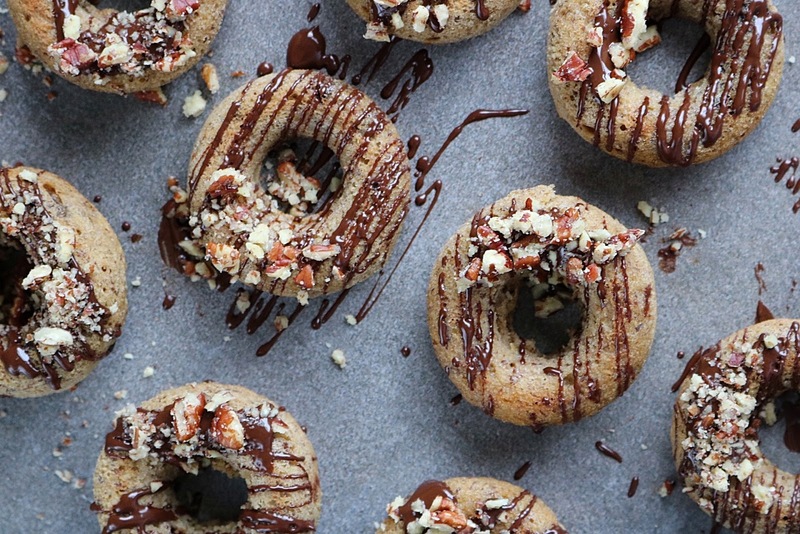 Lets get started with what your going to need to make these delicious doughnuts. This made 16 mini doughnuts for me, i had to make them in two batches. Start off mashing up your banana so its fairy smooth and the least amount of lumps you can get, add in your sugar and flax egg then add in your yogurt. Once everything is nicely combined sieve in all remaining ingredients, then lastly fold in those chocolate chips! Bake in the oven for 10 minutes at 190c fan. If your making them larger you may need to adjust this time slightly. Insert a toothpick and make sure it comes out clean. Once out of the oven leave to cool in the tin before drizzling with melted chocolate and topping with those lovely chopped pecan nuts.